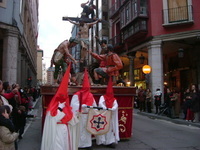 As Spain is a Catholic country, Easter, (Semana Santa) “Holy Week”, is the most important celebration of the religious calendar. The spectacular celebrations go back centuries and the processions through the streets were invented to teach the fall and rise of Jesus Christ. I have been lucky enough to experience the most traditional celebrations which take place in Castilla y León (Valladolid). However, the most flamboyant processions can be seen in Seville and Málaga in Andalusia. Read on to find out how Spain celebrates Easter. How long are the Easter celebrations? Easter lasts for ten days, beginning on Viernes de Dolores (the Friday before the Holy Week) and finishing on Domingo de la Resurrección (Easter Sunday). 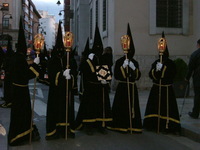 Every evening there are processions through the streets from each of the brotherhoods (cofradías) in the city. The first thing you will notice is how solemn and sombre the atmosphere is compared to most other Spanish fiestas. Those who participate are silent and all you can hear is the loud beating of the drums. 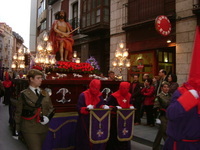 Each brotherhood carries two floats (pasos); one carrying Jesus Christ on the cross and the other carrying the Virgin Mary. They are very heavy and it takes several men (costaleros) to carry them. The processions last for several hours therefore the pain they suffer represents the pain suffered by Jesus Christ on the cross. Some people also decide to walk barefoot through the streets or even attached to shackles or chains as penance. What is the traditional costume like? 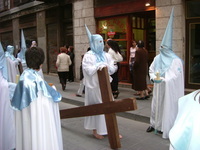 Those who take part (nazarenos) are often compared to members of the Ku Klux Klan as they wear similar looking tunics, cloaks with hoods covering their face and the pointed hat (capirote). 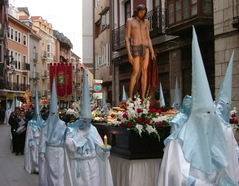 However, note that the costume has nothing to do with the KKK, in fact, the members of the Ku Klux Klan saw these Holy Week costumes and decided to use similar robes due to the effect they have on the spectators. Each brotherhood from the different churches within the city wears a diffierent colour tunic, hood and cloak. They also normally carry candles or crosses. On the last day of the processions, Domingo de la Resurrección, (Easter Sunday), the mood changes completely and it is a much cheerier atmosphere. They remove their hoods that they have worn all week to celebrate the resurrection of Jesus Christ. In Valladolid what also happens is that white doves are released into the air in the main square which is a really beautiful part of the celebrations. If you would like to find out more about Semana Santa (Holy Week / Easter) is celebrated in Spain, have a look at Wikipedia’s page on Holy Week in Spain.